Whether it’s a sidebar opt-in, an exit-intent pop-up, or a Welcome Mat, it’s all a balancing act because, as you probably know, blogging is a business. Growing your email list should be one of your primary focuses because it allows you to communicate and market to your visitors after they’ve left your site. But what if there was another way you could keep in touch with your visitors? Better yet, what if you could display a notification directly in a user’s browser, even when they aren’t visiting your website? Almost like the notifications you receive on your mobile phone every day. Well, if that sounds too good to be true, it isn’t. The technology is called “Push Notifications” or “Web Push” and it’s available in recent versions of modern browsers like Chrome, Firefox, and Microsoft Edge. And with Google’s recent announcement that they’re going to be looking at pop-ups as a negative ranking signal for mobile devices starting in 2017, there’s no better time to get started with push notifications. When you click on allow, you’re giving the site owner permission to send you in-browser, real-time notifications – and they’re clickable. These can be any number of things like deals, special offers, exciting news, or even just a notice that the site published a new blog post. Once you’ve allowed push notifications, you don’t have to be visiting the site to receive them; you could even be browsing an entirely different site. You’ll still receive a pop-up notification on your desktop or mobile. It’s that easy. Why have push notifications enabled on your site? Two words – they’re quick and easy. Growing a list of engaged followers takes time. Many bloggers feel the pressure to create an awesome lead magnet or make content upgrades every time they publish a blog post. And well, that’s time-consuming for a blogger. Wouldn’t it be nice to find a way to rapidly grow a list of visitors who are interested in receiving notifications from you, with very little time invested in setting it up? That’s where push notifications come in. There’s no need for visitors to type in their email address or click several times. With push notifications there’s only one click. This makes it easy for your visitor to join your marketing list and start getting notifications from you. Just to be clear, this “marketing list” is not an email list – it’s a list of browsers that have agreed to receive push notifications from you. But don’t let that discourage you. You may even have better results with push notifications than with your email marketing strategy. While typical email funnels yield a 1-4% conversion rate, with push notifications, it can be as high as 30%. So, simply using push notifications gives you a better and higher ROI over email. For bloggers who are looking to monetize their site, these are great numbers to have. Let’s look at the pros and cons of using push notifications on your site. On the plus side, push notifications are a new concept, which means people haven’t learned to tune them out yet. Since visitors aren’t yet plagued with banner blindness for a push notification, it’s a currently a highly effective tool. For example, Adam Connell tested push notifications on UK Linkology. CTR (click-through rate) was around 15-25% when promoting new content. Another pro is that push notification technology works on the Android versions of Chrome and Firefox too (though not on iOS or Safari yet). Having this ability on mobile lets you tap into that audience without having to pay a developer to create a mobile app for you – just so you can send notifications. One final pro is that notifications are clickable, making it easy to send a visitor to a landing page. With Thrive Landing Pages (aff), you can easily make a landing page for each notification – increasing your chances of making more sales or gaining more email subscribers. There are some cons to having push notifications on your site. The biggest con is that it could affect your email opt-in rate. Visitors are immediately greeted with a notice asking them to allow push notifications. As they browse through your site, they may be presented with various lead generation pop-ups and as they leave your site, they might also be intercepted by an exit intent pop-up. That can be a lot of distractions! Yes, you can remove some of your lead generations pop-ups and it might be a good thing to test, but since push notifications don’t give you the user’s email address, you’re still going to want to attempt to capture it at some point. You may notice a drop in email subscribers once you implement push notifications. Some visitors won’t want to subscribe to your multiple offerings but this may still work to your advantage from an ROI perspective because as we learned earlier, you can potentially gain a 2x-10x better ROI from push notifications. Finally, another con is that a push notification can potentially interrupt and distract your visitors. Both the initial confirmation box and later, the notifications that pop up when they’re online, on social media, emailing or even writing a blog post might disrupt your visitor’s concentration and irritate them. Since Elna first wrote this post, I’ve come across 2 other issues. 1) Migrating to a different push notification provider – I’ve only used Pushcrew and Pushengage so far, both tools do allow you to export your subscribers but they require that you have a paid plan, and FCM keys setup to export Google Chrome subscribers (Firefox subscribers do not require keys and are already portable). Now, there is a catch – in order for this to work, you need to have HTTPS (SSL) enabled on your site. However, the team at PushEngage have an alternative for those without HTTPS. The alternative involves setting up a sub-domain for HTTPS, rather than switching over your entire site – more information can be found in this post by PushEngage. These ‘keys’ are for Google’s Firebase Cloud Messaging platform, which is supposed to work with browsers other than Chrome. But, I’m not 100% sure at this stage – if you have the answer to this, please let us know in the comments. Unfortunately it does mean that if you use a free account or don’t follow the post I mentioned above, you’ll be locked into using a single vendor. 2) Your subscribers may change browsers – Push notifications only work with the browser/device that someone subscribers to. For example, I have two computers. If I subscribe to a site on my PC, I won’t get them on my Mac. And if I change my PC, I’ll likely not get them on my new one unless I re-subscribe. While this is a definite drawback, it’s not a deal breaker. Especially when opt-in rates for push-notifications are so high. Some subscribers will likely re-subscribe the next time they visit – not all, but some. Don’t let these issues deter you from trying push notifications. Sure, they’re not as tried & tested as email marketing but they show a lot of promise. I would never recommend them as an alternative to email marketing, but they make a great addition to any lead generation strategy. Unlike sending an email or uploading a PDF file to your blog and giving your visitors the link, push notifications aren’t something the average blogger can “do” entirely on their own. Adding the code to your website is easy – and some popular providers even have a WordPress plugin – but in order to actually send out the notifications, you’ll need a push notification provider. Similar to an email service provider, like ConvertKit or MailChimp. Luckily, some of the popular push notification service providers have a free plan – if you’re below a certain number of push subscribers – so you can get started at no cost. We like PushEngage and their Forever Free plan for up to 2,500 subscribers. PushEngage works with a variety of browsers, including Firefox and Chrome, for both desktop and mobile. No matter if you have an HTTP or HTTPS website you can enable push notification in five minutes or less. And with the ability to create targeted notifications and customized segmentation – including by geo location – you’ll have better click-through rates and lower unsubscribe rates. One thing PushEngage recommends is to use a welcome notification for new subscribers. Just like a visitor opts in to grab your lead magnet and receives a confirmation email, it’s also a good idea to do something similar for your push subscribers. It can be a bit confusing for visitors to click on a pop-up and then nothing happens. Did they click the right button? Did it go through? What next? Having that quick welcome notification can help new subscribers understand what just happened. 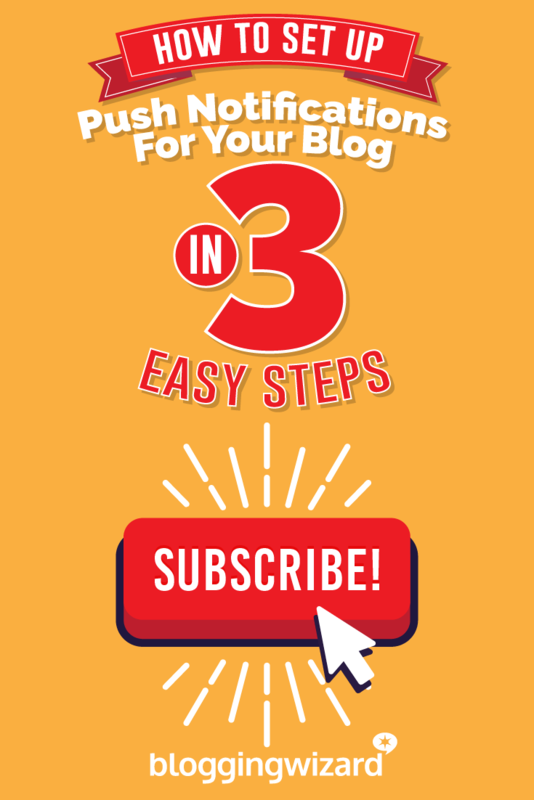 Setting up push notifications for your blog is as easy as three steps. After you register for your free trial, you’ll see the PushEngage dashboard. Scroll down to check your site settings. If the fields are correct, the only thing you need to do is set your brand image for your blog. If you scroll down further, you’ll see the default welcome message template – and what the actual notification looks like when it’s sent to someone who has subscribed to your push notifications. If you have a secure (HTTPS) site, your push notification subscription box will be shown as is. There isn’t a way to change the look or language of the notification. But, if you have an HTTP site, you have more options to customize your copy and its placement. PushEngage offers four different options for your dialogue box. They recommend the Single Step Optin as it’s likely to generate more subscribers. You can locate your API under Settings and Get API Key. 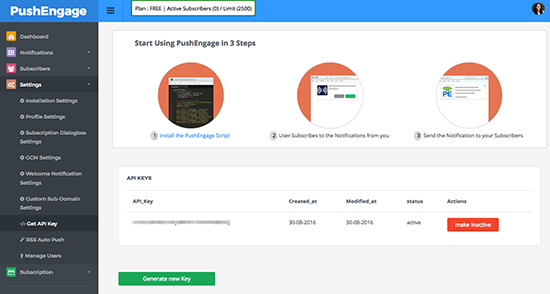 From here, go into your PushEngage plugin and paste your API key. And you’re done! When you visit your site, your notification will pop up. If you have an HTTPS site, there are a few more steps involved. But, it’s almost as easy if you follow the instructions from PushEngage. Another popular option, PushCrew, also has a free plan, but they limit you to 500 subscribers. PushCrew currently provides push notifications for Chrome and Firefox on Mac, Windows, Linux, Chrome OS and Android. It allows you to send real-time messages to engage with your audience on a new level. It works on both desktop and mobile and visitors don’t even need to be on your website to be notified. And with PushCrew’s API, you can be more strategic in your notifications by making them personal. You can use your push subscriber data combined with Google Analytics and even segment your subscribers based on a variety of conditions. PushCrew is free to use for unlimited notifications for the first 500 subscribers and includes segmentation, RSS-to-push, email support and more. For up to 2,000 subscribers, prices start at $25/month. Push notifications are a new technology. It will be interesting to see how things develop in this space, but for right now, there’s nothing to lose – and everything to gain – when it comes to being an early adopter. If you’ve got all of the blogging basics down, it’s well worth trying. Sign up for one of the tools above and you’ll be surprised at how easy it is to get started.